YDance Active is a Scotland-wide project delivered by YDance (Scottish Youth Dance), the national dance organisation for children and young people. YDance Active is a Scotland-wide project delivered by YDance (Scottish Youth Dance), the national dance organisation for children and young people. The project aims to inspire and motivate teenage girls to be more physically active through dance. It also aims to increase the number of dance opportunities for young people in schools and communities, increase the number of qualified Dance Leaders in secondary schools across Scotland and develop teachers’ skills and knowledge in dance to allow them to support the young women who become Dance Leaders through the project. To achieve this the project delivers 1-day dance workshops, week-long Award in Dance Leadership courses at Level 1 (SCQF Level 4) and Level 2 (currently QCF Level 2) for teenage girls and Career-long Professional Learning sessions for education staff through a Workforce Development Programme. To date, since September 2012, over 10,500 teenage girls and over 400 members of education staff have participated in the project, delivered in 28 of 32 Scottish local authorities. 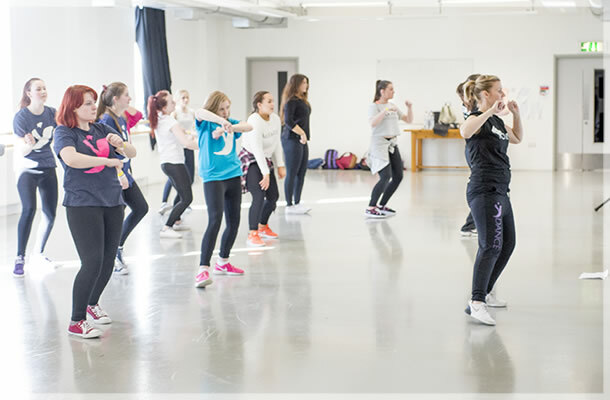 YDance Active is the only project of its size to be delivered in schools in Scotland aimed at encouraging and supporting teenage girls aged 13 to 18 to participate in physical activity through dance. Young women in Scotland tend to lose interest in physical activity when they reach adolescence and YDance Active has played a critical part in promoting a healthy and active lifestyle in a fun and safe female-only space. During week-long Award in Dance Leadership Level 1 and Level 2 courses girls are developing their leadership and communication skills and learning how to plan and deliver a quality dance session as well as a host of other skills to ensure they finish the course as qualified Dance Leaders. Both nationally recognised qualifications enable successful learners to lead groups in dance activities whilst under the supervision of their Tutor/Assessor or other suitably qualified adult. To date over 1,800 girls have achieved an Award in Dance Leadership and are now qualified to help facilitate dance activities and inspire other young people in their schools and local communities. The process has improved the confidence of many participants as they are encouraged to speak in front of groups of their peers and lead them in dance activity. Important skills for employment are being developed in each Dance Leader as they learn how to lead and motivate others and how to work constructively in a group. The project provides an excellent opportunity for participants to reference their Award in Dance Leadership in their CVs and/or in interviews for a range of school, higher and further education or employment opportunities. The project is sustained by continuous support from the project Tutors and the YDance Active online digital hub. The YDance Active team has developed an online resource for Dance Leaders and education staff which gives them access to numerous video tutorials talking viewers through warm-ups, cool-downs, and dance steps across a range of dance styles through easy to follow instructions. Visitors with a password to the site have access to regularly updated lesson plans, all of which can be adapted to create new fun and engaging dance sessions. YDance Active is currently looking forward to the second annual LeaderFest event at Edinburgh College in March 2016. All Dance Leaders in Scotland are invited to take part in a variety of workshops led by choreographers specialising in different dance styles, and have a chance to see inspiring performances by other young dancers. An important element of LeaderFest is the Spirit of Leadership Awards ceremony. Dance Leaders nominated by Active Schools staff are awarded for their outstanding contribution to Leadership and are recognised in front of their peers for their exceptional efforts to champion dance in communities up and down the country. YDance Active is delivered as part of Active Girls, a Scottish Government funded programme, managed by sportscotland and delivered in partnership with YDance, Youth Scotland and The Youth Sport Trust. For more information about YDance Active please visit www.ydance.org or call the YDance office on 0141 552 7712.